USB C to HDMI Cable lets you use the USB Type-C port on your computer to directly deliver visuals on your HDMI-equipped display without the need for cumbersome adapters. 1, Supports resolution up to 4K*2K(3840*2160)@30Hz. Backward compatible with 1080p, 3D. 2. Plug and play design, no external power and driver required with this cable. 3. 6.6 feet/2m HDMI 1.4 Cable. 4. 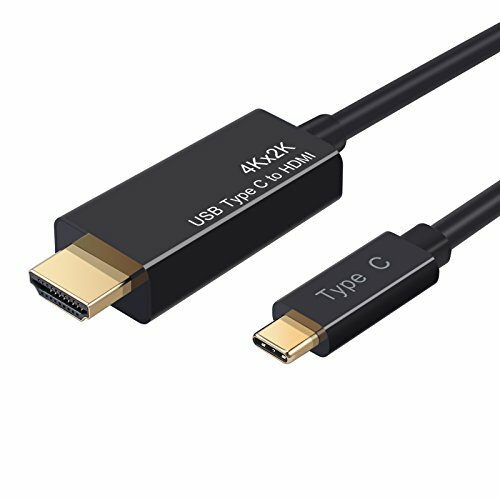 Both USB-C and HDMI connectors are gold-plated, designed for maximum conductivity, and improving the signal performance. 1.The cable works for Thunderbolt 3 compatible Type-C port only. It is not suitable for iMac 2017, MacBook pro 2017. 2.It is only compatible with computers with DP alt mode, not for USB-C smartphones (Except Galaxy S8 or S8 Plus) and tablets, as most of them work with MHL or SlimPort solution. 3.It needs 8-10 seconds for the signal to synchronize from computer with your monitor. 4.Using this cable on Lenovo Yoga 910 is NOT recommended. 5.It will not work properly as outputting video resources that support HDCP such as Netflix, Amazon, Hulu. 【2m/6.6ft HDMI 1.4 Cable】6.6ft/2m USB C to HDMI Cable Enables you to Directly Connect a USB-C Computer to an HDMI-equipped Display without Connect any Adapter or Converter. 【Up to 4K@30Hz High Resolution】Resolution up to 4K x 2K(3840 x 2160)@30Hz, Support 3D Visual, Backward Compatible with Your Monitor. 【Gold-plated Connectors】 Both USB-C and HDMI Connectors are Gold-plated, Designed for Maximum Conductivity, and Improving the Signal Performance.